Acknowledgement: In this chapter we see the work of Dr. Ahmad Hariri and colleagues; and Dr. Kilpatrick and colleagues. In Chapter 1, we looked at the effects of the short version of the serotonin transporter gene on depression risk. 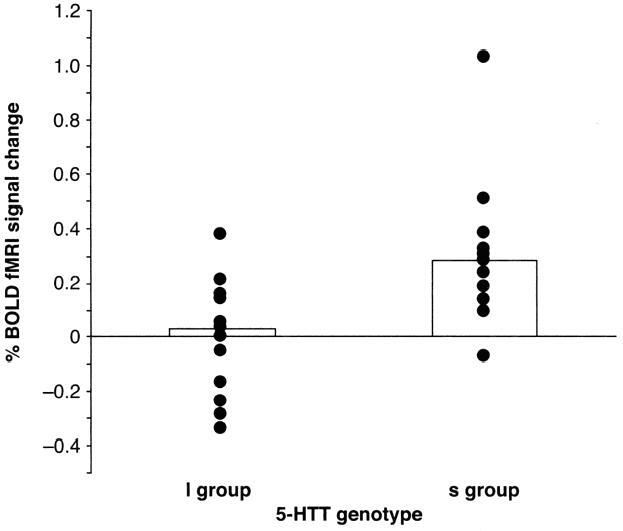 Inheriting two short versions (“alleles”) is associated with much higher rates of depression than seen in people with two long versions. However, it appears that inheriting two short alleles is associated with other differences in mental health as well. People with “two shorts” — the “Blue People” from Chapter 1 — are more reactive to fearful stimuli: their brain’s fear center, the amygdala, becomes more active than that of people with “two longs”. Secondly, they are more likely to get Post-Traumatic Stress Disorder (PTSD) when exposed to a traumatic event as adults. And finally they are less likely to respond well to typical antidepressant medications. We’ll look at each of these three lines of research in that order below. Research clearly shows that human fear responses, such as when you see someone who is in a position to hurt you frown in anger, are controlled in some way by a part of the brain called the amygdala. You can learn about the location of the amygdala in the human brain using the Brain Tour about fear. 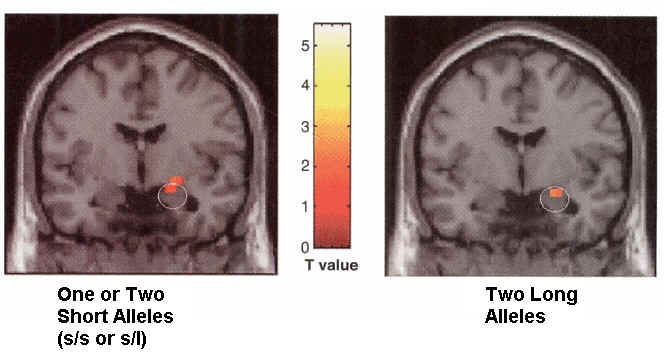 Comparing to the “two longs” group on the left (the L group), you can see that there was more brain activation caused by fear-images in the amygdalae of the subjects with “one or two shorts”, the S group on the right. Like the story from Dr. Caspi and the New Zealand research team (Chapter 1), this work also was published in Science, because of the implications of the results as well as the precision of the research. Yet many others, exposed to the same stresses, did not develop these symptoms. Why not? This is the work of Dr. Dean Kilpatrick and colleagues, 2007. What about depression? Wouldn’t you think that having two shorts would also affect response to an antidepressant there too? It appears likely that this is also true: several studies have already shown that people with two shorts do not respond as well to antidepressant treatment. But as reviewed in 2004, Malhotra a few studies have not found this result, including one in Korea, suggesting that there may be an ethnic difference or other factors which may need to be taken into account. 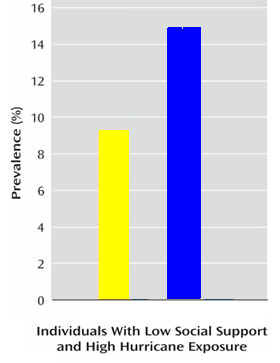 Perhaps one of those factors might be childhood trauma, as shown in the original study about yellow people and blue people (Chapter 1), where the difference in depression only showed up when combined with a rough childhood. Ideally we could use this kind of information to choose treatments most effective for a particular person’s genetic makeup. So far that’s still out of reach: the studies referred to here show general differences, not accurate predictors of treatment response. The results described here are not consistent enough to say “Oh, you have two longs? You’ll do well on this medication”; or “You have two shorts? You’d do better to start with this treatment approach”. I’ll try to keep this section updated as more research in this area emerges.